… and about time too, since I’ve had the fabric for 18 months. keep ALL the fabric in the bin. 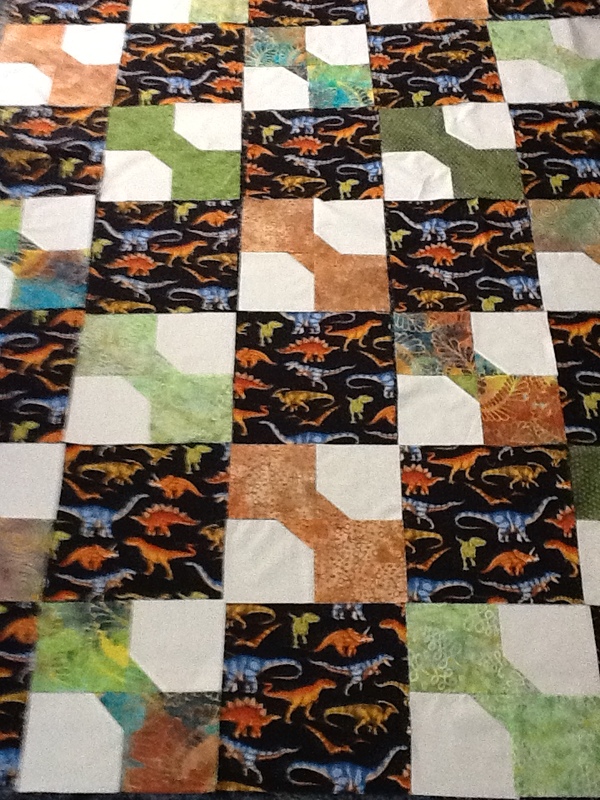 I was nervous of running short of dinosaurs but when I came to make the remaining bow tie blocks the other day I thought I had run out of the background neutral, so three blocks have a different background. Then I found plenty of the original planned background fabric that had been stashed in another spot. I debated picking the blocks apart but decided that done is better than perfect, especially when Young Sprout, the intended recipient, knows about the quilt and is not getting any younger. buy plenty of the focus fabric so there’s enough for a pillowcase. I already made and presented the pillowcase for this quilt. Google images was my friend. I searched for images of bow tie quilts and scrolled down until I found one made with a similar design to what I had in mind. I don’t have EQ software and if I did I’d either sit and play with it and never sew anything, or I wouldn’t use it at all. With smaller blocks it’s fun and easy to put them on the design wall and move them round. These blocks will finish to 12 inches for a total size of 5 feet by 7 feet, which is far too big for my design wall. So we laid them out on the floor and I made sure that we liked the look of having all the bow ties going the same way. My low-tech friend was masking tape. 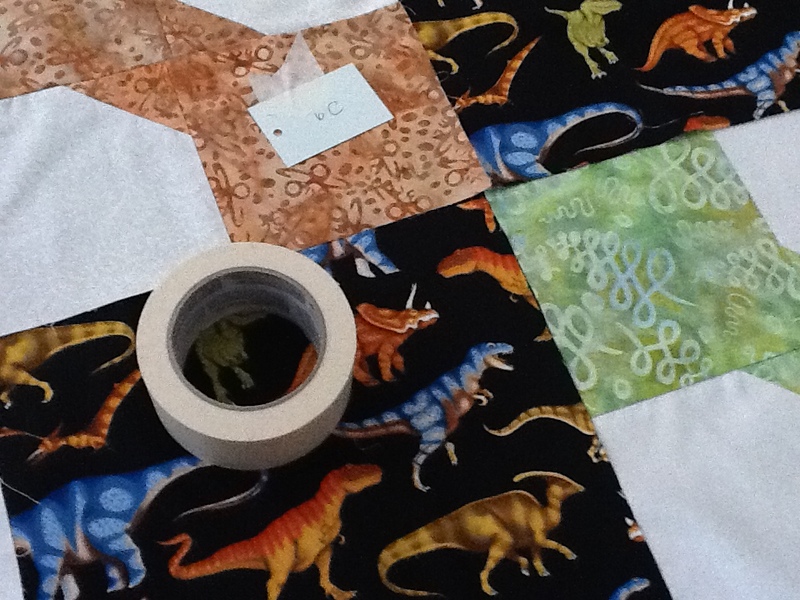 Since the squares of dino fabric are virtually interchangeable, I just labeled the bow ties. Now if I lived in a home with an atrium or a large hallway with a balcony on the second floor I could do it with photos … oh well, think of all the dusting and vacuuming THAT would entail! And here’s my other low-tech friend. Yup, pen and paper.